David Healy said the feeling was one of ‘pure happiness’ after Linfield’s dramatic late comeback win over Coleraine. The league leaders looked to be heading to a defeat after an insipid first half performance. Goals from Gareth McConaghie and Dean Shiels had put the Bannsiders in complete control. 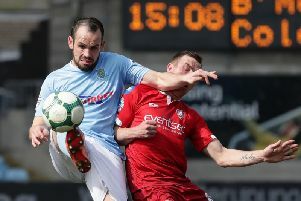 But a tactical change from Healy made the diference with Josh Robinson and Niall Quinn getting them back on level terms before Kyle McClean’s late winner, which sent the home support into raptures. “I spoke to the players at half time and we binned the first 45 minutes. “We were miles off it and I take full responsibility for that as a manager. “I set us up the wrong way and I wanted us to play in a manner were I thought we would be more attacking and it did not work. “At half time I managed to change things, I changed the formation and made a couple of tweaks so it was my fault for the opening 45 minutes. “I’m delighted with the players and delighted by our response. It took us a while to get a response but credit to the players today because this is such a hard place to play because of past teams and the history of the football club. “People compare this group of players to the team which won the clean sweep and compare them to the clean sweep team in the sixties but those days are gone. “We are living in the here and the now, this group of players have given me so much this season and it is a credit to them that they didn’t go under. “It might have been easy to have gone under at half time and maybe get back to 2-1 but they didn’t and they were deserved winners in the second half. The Linfield boss had issues with both of the visitors’ goals and questions several other decisions by the officials on the day. “I thought some of the decisions today were questionable, probably about 99 per cent of them,” he said. “Their first goal we switched off, it was poor defending by us but it was a handball by Glackin. “The second goal, for me a linesman at that speed it is a guess. “Unless he is looking directly at it I do not think at full speed he can call that unless he is a hundred percent sure. “Chris Casement had a fifty fifty tackle on the touchline, won the tackle and the linesman, who gave Linfield nothing today, awarded a free kick. “He was guessing at offsides, he was guessing at throw ins and he was waiting on the referee and the fourth official to make a decision. Coleraine boss Rodney McAree was understandably frustrated that his side had thrown away a two-goal lead. “Whenever you’re two-nil up and coasting to be honest, I thought we were well in control of the game, but we started to do things differently than what we had been doing up to that stage for whatever reason,” he said. “Instead of losing the ball in the final third, we started to lose the ball in the midfield third, which allowed Linfield to be on our back four straight away. “I thought that side of things invited Linfield onto us. “The first goal we have got to defend the set piece better but in my opinion I don’t think it’s a free-kick,” he added.